BlackBerry 10 is the last hope for Research In Motion (RIM) to survive in the smartphone market as since the past one year or so, the company has not been able to attract a lot of consumers. We have seen quite a number of codenames of the upcoming BlackBerry 10 devices but we have heard about the London and Nevada, the most. 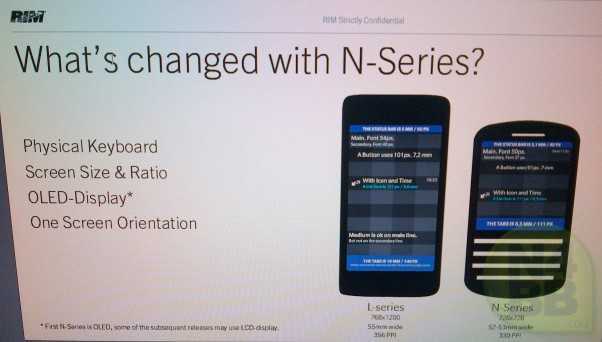 Now from what seems to be an internal presentation slide that has leaked by RIM, there are going to be two series of BlackBerry 10 smartphones. The London based L-Series would be the full touch smartphones which would arrive as early as in August. Whereas the Nevada based N-Series as we already heard about and know, would arrive with the BlackBerry 10 OS on it and the traditional full QWERTY hardware keyboard. The BlackBerry L-Series is said to be arriving with a screen resolution of 1280 x 768 with 356 PPI (Pixel-per-inch). Also the screen is said to be 55mm wide on arrival. The screen is said to be the same, as that on the BlackBerry 10 Dev Alpha device and it looks awesome. On the other hand, the BlackBerry N-Series is said to be listed with a square screen resolution of 720 x 720 with 330 PPI and width of 52 to 53mm width. The initial N-Series smartphone would arrive with a OLED display and later with a LCD Display. The N-Series BlackBerry 10 smartphones are expected to arrive only by Q1 2013 but we just hope that RIM releases the QWERTY N-Series a lot before to grab all the prospective users who are waiting for the smartphone on BlackBerry 10.